67 Music leads the podcast Celtic music from Finnegan's Hell, The Flying Toads, Connla, The Fretless, The Kilt Lifters, Daimh, The Pikeys, Dylan Foley, The Crooked Jacks, Raglan, Syr, The Syncopaths, Bill Mullen, Calan, SugaTree, Barleyjuice. "Weekend Irish" by Barleyjuice from Live Juice! Look for both The Kilt Lifters and Syr on the next edition of The Celtic Music Journal coming soon. Australia's SugaTree were just awarded by the Australia Celtic Music Awards "Best New Talent of the Year" and "Best Celtic Song of the Year" for "Nothing Else". It's our 10th year Anniversary! 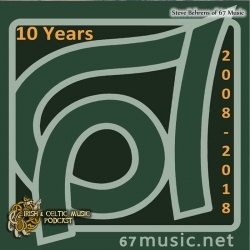 Since 2008, the primary goal of 67 Music has been to bring global attention and recognition to Celtic music in all it's forms, and to the artists who make it. Also to strengthen the Celtic community and maintain the grand heritage. We are a Celtic music media and promotions company. Our music media side includes entertaining and informative interviews, reviews, articles, videos on our YouTube Channel and our web based show The Celtic Music Journal. This is our web tv show where we spotlight Celtic artists from around the world with their Journals showing you what they do. To date we've produced 9 editions of the show and are currently working on the 10th. The Celtic Music Journal~ "You've got to watch this"! I hope you all enjoyed this episode! I had a great time, thanks to Marc for letting me guest host once again! The Irish & Celtic Music Podcast is supported by listeners like you. Your generous pledge helps pay for the production and promotion of the podcast and its artists, as well as my time in producing it. Patrons get episodes before regular listeners, discounts on merch, and when we hit a milestone, you get a two-hour special. Our next milestone will bring 2-hours of Celtic flute and whistle music to your ears.